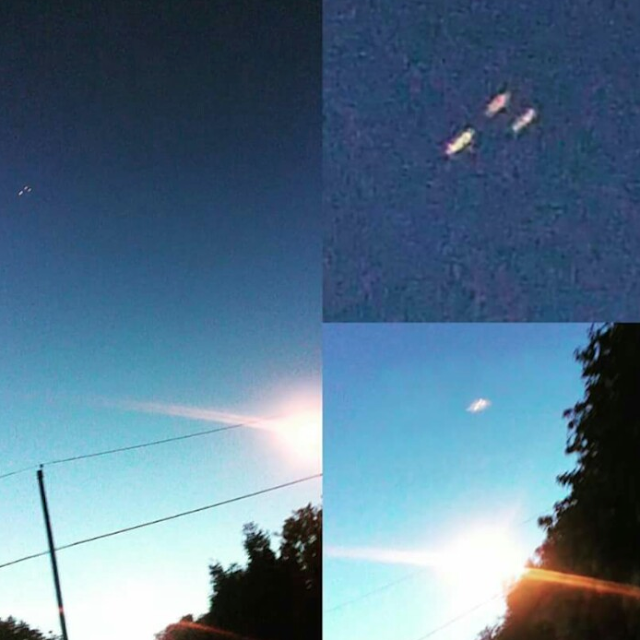 UFO SIGHTINGS DAILY: Three UFOs Seen Over Canton, Ohio On Oct 9, 2016, UFO Sighting News. Three UFOs Seen Over Canton, Ohio On Oct 9, 2016, UFO Sighting News. UFOs that are cloaked are impossible to see with the human eye and could only be seen with an IR camera. However these three UFOs were seen just before sunset, when the sun was at nearly a 75 degree angle from the the UFO, allowing the person on the ground to witness the event. This compounded by the fact that the woman saw the three UFOs moving quickly across the sky, just makes this an extraordinary sighting. She saw the three shapes moving across a blue sky and took the pictures with her cell phone.she said they moved very fast.